As previously mentioned in last week’s Spotlight, the assessment is perceived by many of the programs as an opportunity… but an opportunity to do what? For the Mental health Program of Niagara Region, it is an opportunity to re-evaluate what you are doing and change it up (Krista Whittard). We are all busy dealing with the day to day work of delivering services and sometimes it can be hard to take a step back and reflect on how things are going and how they can be made better. The fidelity assessment is an opportunity to do just this. It highlights program strengths and helps programs capitalize on them. It also helps programs identify areas where they can improve. For Krista’s program, the fidelity assessment reminded them of the great job they do at community outreach, which is critical for their diverse rural/urban split. But it also showed that there are other areas of the program that have received less focus. These may be opportunities for quality improvement efforts going forward. Finally, the fidelity assessment helped them to prioritize and figure out where to focus their energy. This is important for everyone, but particularly small programs like Niagara. For Heads Up!, where Jennifer Jackson operates as the clinical lead, the assessment has led to increased continuity among the various services that are being provided. Quality improvement doesn’t need to be a huge undertaking. There are always some quick changes that are easier to make. For Heads Up! the assessment helped them identify a simple change that can make a big impact: changing the structure of their forms to identify what is occurring in treatment sessions, in order to document the services they are providing more accurately. On a larger scale, Heads Up! has also identified the need to develop clinical pathways to provide more consistency in practice within their case management team. 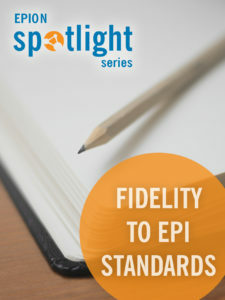 As the fidelity assessments continue, and more programs are assessed, it can only bring more information to the EPI community. “It is keeping people [and programs] on their toes” (Sandy Brooks, PSSP assessor), and it’s no surprise that this dedicated group of people want to be kept in their toes, they want to provide the best possible service to the people receiving our services. The Lynx EPI program is a regional network of six agencies working across five clinical team sites, with natural differences and nuances amongst the five sites. As a result, they determined it would be beneficial to complete a fidelity assessment at two of their locations to capture and bring focus to some of these variances. The peer fidelity review provided very helpful information, highlighting areas where they were consistent, areas where they had unique challenges, and suggested strategies for quality improvement. The Lynx program had also completed a value stream analysis just prior to our fidelity assessment, and together, areas for improvement noted during the fidelity review and the value stream exercise were incorporated into a Strategic Work Plan that will carry us through the next three years. To highlight this sentiment, Anne-Marie explains that their regional team engages in regular meetings throughout the year, however they did not have a consistent meeting for the local clinical team at one of the sites. As a result of the fidelity assessment, this site now has a weekly team meeting where the clinical team reviews intakes, discharges, and discusses best practice strategies for how to support youth and their families. Due to the implementation of this clinical team meeting, the team has united, and fostered an extremely valuable atmosphere for collegial peer support. Another area for improvement was in their assessment process. The assessment tools and processes varied by site, and the Fidelity review offered them the motivation coupled with specific recommendations they needed to decide on a standardized and consistent assessment process for all of the Lynx program, across all communities. Anne-Marie feels that landing on one tool will save time and energy for the team, ultimately leaving more time for working directly with our EPI participants, which is the heart of why we do this work. Ultimately, the results have confirmed to EPION that this is an initiative worth investing in. The results and positive feedback have fueled the second wave of fidelity assessments. Look for our update in October highlighting the training for our new assessors, and our assessor team!